Mitsubishi’s Lancer Evolution has been rolling the dices in the automotive world since long. Finally the company is coming up with the final 10th generation model through Mitsubishi Lancer Evolution Final Edition 2015; a sports sedan. With rumbling power beneath its hood and unmatched looks. 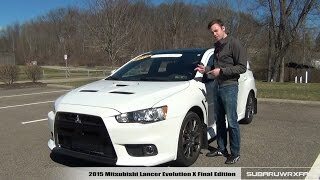 Let us have a closer look at the details through review of Mitsubishi Lancer Evolution Final Edition 2015. The interior of Mitsubishi Lancer Evolution Final Edition 2015 is gorgeous till the peak. Moving inside you’ll notice the Pillars, sunvisors, assist handles and headliner drenched in black while the sports seats, shift knob, e-brake handle, console lid, shift knob & floormats gets the essence of red stitching to complement the former. Behind the three-spoke steering wheel is the meter display that displays the Final Edition animation and thus makes this model more special and distinct. You’ll also notice the center console box with a unique production serial number that makes each of the models stand apart in their own way. The interior isn’t just about the looks but is also equipped with safety features like the advanced seven airbag system which includes the knee airbag on driver’s side, front bags and rear curtain side bags. ABS and EBD join the league with the ASC and TCL systems. 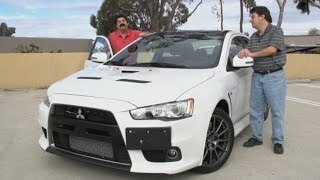 In all rounding up the interior details of Mitsubishi Lancer Evolution Final Edition 2015 I would say it has everything that makes it special in class. The exterior of Mitsubishi Lancer Evolution Final Edition 2015 has been designed in a way to make it look distinct and special. The primary inclusion in this context is the Final Edition Badge. The roof is made from aluminum and comes drenched in black color. Upfront you’ll notice auto on/off bi-xenon High Intensity Discharge headlights featuring leveling control while the traditional grille comes with dark chrome surrounds. There is also a gloss black center bumper and a hood air outlet to provide some fresh air to its powerful engine. 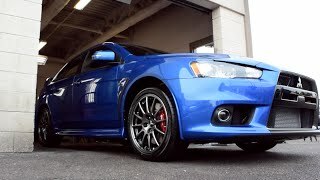 The exterior of Mitsubishi Lancer Evolution Final Edition 2015 comes in four color options, this includes; New Pearl White, Octane Blue, Rally Red and Mercury Gray and rolls over dark chrome painted bold alloy wheels. Beneath the hood of Mitsubishi Lancer Evolution Final Edition 2015 is a 2.0 Liter MIVEC DOHC 16-valve four-cylinder turbocharged engine cranking total output of 303 hp and peak torque of 413 nm. 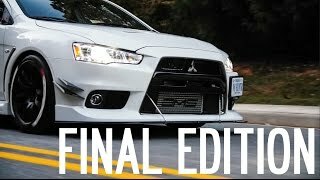 The performance figures of Mitsubishi Lancer Evolution Final Edition 2015 are not yet shared but we assure to bring them at the earliest.